The word "superlative" points in the direction of supreme or extreme. It sets a high standard. 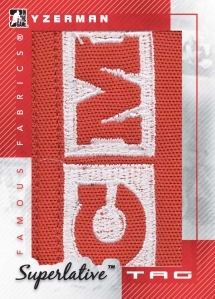 With that, 2012-13 In the Game Superlative 3 Hockey aims for the hobby's pinnacle with lots of high-end hits and unique content, not to mention the hefty price tag that comes with it. 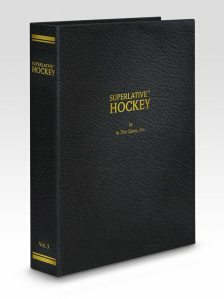 Limited to 1,500 boxes, 2012-13 In the Game Superlative 3 Hockey features several hits-focused inserts that go deep into the sport's history. It's an all-chase release that promises one autographed memorabilia, two autographs and three game-used memorabilia cards in every box. All cards are also extremely limited. Skate cards have been done before, but not very often. 2012-13 In the Game Superlative 3 takes the idea a bit further with Skate Laces. The cards embed a front portion of the skate, leaving a unique look and texture. The focus for these cards is vintage players. 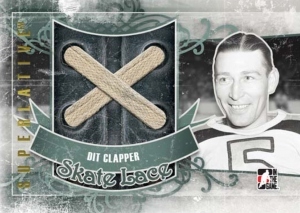 Sticking with the vintage theme, PaperCuts go back into in time to offer cut signatures from some of the most important names and builders in hockey's history. 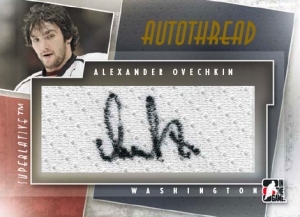 AutoThread cards start with a large game-used jersey swatch. They go on to include an autograph from the featured player. Superlative Tag and Superlative Emblem cards promise massive patch swatches. Superlative Prospect autographs offer autographs from some of hockey's rising stars Regular Silver versions are limited to 30. Gold parallels have just ten copies each. Superlative Game-Used Patch cards mix past and present stars. Falling one per box, all are limited to 19 copies or less. Superlative Game-Used Jersey cards follow suit as far as the player mix goes. None have more than 30 copies each. Click here for a complete 2012-13 ITG Superlative 3 checklist. Great set. Have yet to see a bad box. 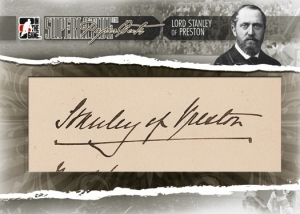 Incredible memorabilia, and an even better checklist. Price a bit steep IMO, even for high end.